About 2.3 million Americans are currently living with atrial fibrillation (AF), and the prevalence is expected to increase to 5.6 million by 2050. AF increases the risk of stroke nearly five-fold and is associated with up to 15% of all strokes in the United States. It imposes a substantial economic burden to the healthcare system, specifically because of stroke management and hospitalizations costs. Recently, the FDA approved dabigatran (Pradaxa, Boehringer Ingelheim Pharmaceuticals, Inc.), an oral anticoagulant indicated to reduce the risk of stroke for patients with AF. The approval was based on findings from the Randomized Evaluation of Long-Term Anticoagulant Therapy (RE-LY) trial, which showed that 110 mg dabigatran was associated with rates of stroke and systemic embolism that were similar to those associated with warfarin, as well as lower rates of major hemorrhage. Dabigatran 150 mg was associated with lower rates of stroke and systemic embolism than warfarin, with similar rates of major hemorrhage. Currently, guidelines recommend using anticoagulation for at least 3 weeks prior and 4 weeks after cardioversion to reduce the risk of associated thromboembolisms, but this recommendation is based on limited data. In the January 18, 2011 issue of Circulation, my colleagues and I had a study published from a post-hoc analysis of the RE-LY trial among patients with non-valvular atrial fibrillation (NVAF) undergoing cardioversion, a treatment designed to convert abnormal heartbeat back to normal sinus rhythm. According to recent estimates, NVAF represents approximately 95% of all AF cases in the United States. Cardioversion is one treatment option for patients with AF and requires anticoagulation both prior to and following treatment in order to reduce the risk of stroke. In RE-LY, 1,983 cardioversions were performed in 1,270 patients. Rates of stroke and systemic embolism and major bleeding within 30 days of cardioversion were low and did not differ significantly between treatment arms (Table). 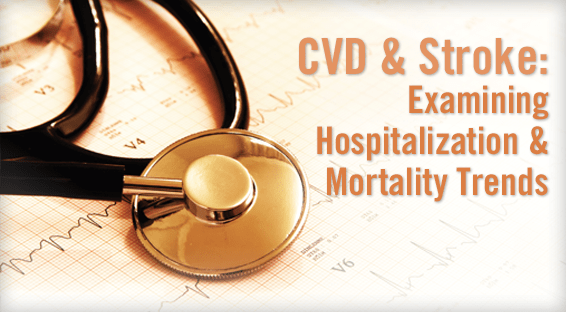 Additionally, the sub-analysis demonstrated that major bleeding rates were low in the cardioversion cohort: 1.7%, 0.60%, and 0.60% for dabigatran at 110 mg twice daily, dabigatran 150 mg twice daily, and warfarin, respectively. 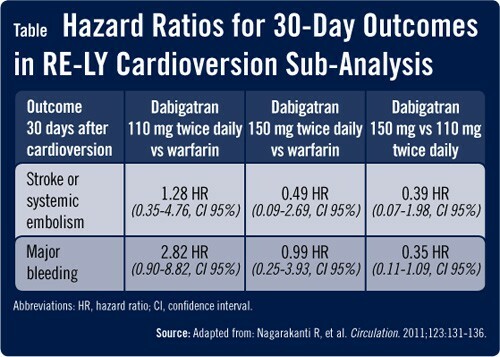 While the rates for higher-dose dabigatran and warfarin were similar, the rate was substantially increased in the low-dose dabigatran group; however, with the low event rate and non-statistically significant difference, it could be a play of chance. Moreover, more patients with bleeding events in the dabigatran 110 mg group were on concomitant non-study anticoagulant and antiplatelet therapies. It’s important to note that dabigatran appears to avoid some of the drawbacks associated with warfarin in the setting of cardioversion. Some benefits relate to dabigatran’s rapid onset of action, while others relate to difficulties in achieving and maintaining an appropriate degree of anticoagulation with warfarin. Because dabigatran achieves therapeutic blood levels within 2 hours and steady-state concentration in 2 to 3 days after twice-daily administration, it has the potential advantage of being more suitable for outpatient management. Ultimately, its use may prove economical by avoiding hospitalizations. Nagarakanti R, Ezekowitz MD, Oldgren J, et al. Dabigatran versus warfarin in patients with atrial fibrillation: an analysis of patients undergoing cardioversion. Circulation. 2011;123:131-136. Wann LB, Curtis AB, January CT, et al. 2011 ACCF/AHA/HRS focused update on the management of patients with atrial fibrillation (updating the 2006 guideline). A report of the American College of Cardiology Foundation/American Heart Association Task Force on Practice Guidelines. J Am Coll Cardiol. 2011;57:223-242. Available at: http://content.onlinejacc.org/cgi/content/full/j.jacc.2010.10.001. Connolly SJ, Ezekowitz MD, Yusuf S, et al; RE-LY Steering Committee and Investigators. Dabigatran versus warfarin in patients with atrial fibrillation. N Engl J Med. 2009;361:1139-1151. Available at: http://www.nejm.org/doi/full/10.1056/NEJMoa0905561. PRADAXA (dabigatran etexilate) Prescribing Information. Boehringer Ingelheim. Ridgefield, CT. Available at: http://bit.ly/pradaxa-info. Accessed January 6, 2011. Rangadham Nagarakanti, MD, has indicated to Physician’s Weekly that he has no financial disclosures to report.